The City of Ottawa is planning to upgrade the Carlington Heights Pump Station (CHPS) Upgrade. The main objective of the upgrades is to improve the reliability of water supply to roughly one third of the City’s central water distribution system, and to provide additional capacity needed to accommodate future urban growth. The project is identified in the City’s current Infrastructure Master Plan. The current design assignment follows the previous work completed under the Carlington Heights Pump Station Site Upgrade Environmental Assessment and Functional Design Study which identified and evaluated various infrastructure alternatives, selected a preferred alternative, and provided for a functional design of the required upgrades. CHPS was originally constructed in 1963. It draws water directly from the adjacent Carlington Heights Reservoir and supplies a population of over 250,000. The City of Ottawa is divided into various water system pressure zones based on providing customers with an appropriate minimum and maximum water pressure. Figure 1 shows the City's various water pressure zones. The CHPS is currently a two zone station serving the Meadowlands East (ME) and 2W Pressure Zones. The 2W Pressure Zone also supplies all of the water to the 3W and 3SW Pressure Zones. The station is a back-up source of water for Zones 2W, 3W, 3SW and SUC Pressure Zones, and is the only source of water for the ME Pressure Zone under normal operating conditions. These zones are noted on the following map. The 2008 Infrastructure Master Plan identified the need for additional capacity at the CHPS. The output of this pump station is limited by pump capacity and the size of the suction and discharge piping near the station. Improvements are needed so that this pumping station can provide adequate emergency supply to Zones 2W, 3W, and 3SW. These improvements will also add capacity to accommodate projected urban growth in these zones. A new building complete with all new mechanical and electrical equipment to provide for the pumping needs for the ME Pressure Zone and the backup pumping needs of the 2W Pressure Zone. Backup power supply for the ME Pressure Zone pumps. A new 914mm diameter suction watermain connected directly to the existing 1200mm diameter watermain on the east side of the reservoir. Four new discharge watermains connected to existing watermains that supply water to the ME and 2W Pressure Zones. Demolition of the existing pump station approximately 6 months after the new pump station has been fully commissioned. The detailed design is 90% complete, but the project is currently on hold while the City’s Drinking Water Services Branch focuses on more critical initiatives. The existing pump station continues to work well, servicing the community adequately and there are no serviceability impacts to the public as a result of this project being put on hold. We anticipate that project design will be completed later in 2018, with construction tentatively scheduled to occur in 2019. We anticipate a two-year construction duration. A public information session took place on 15th May 2017 at 6:30pm at the Carlington Recreation Centre on Caldwell Avenue, to present the background and the main features of the project to the public, and the expected impacts on the site access during the construction stage. The City of Ottawa Infrastructure Services Department welcomes you to the Carlington Heights pump station upgrade project public information session. Staff of the City and the consulting firm Parsons Inc. are available to discuss the material displayed at the public information session. The purpose of this public information session is to present the planned construction project of the new Carlington Heights pump station, the timing of the construction and the related construction activities. The Carlington Heights Pump Station (CHPS) was originally constructed in 1963. It draws water directly from the adjacent Carlington Heights Reservoir (CHR) and supplies a population of over 250,000. The City of Ottawa Infrastructure Master Plan (IMP) has identified the need for additional capacity at the CHPS. Improvements are needed so that this Station can provide adequate emergency supply to the City’s various water pressure zones. This project will improve the reliability of supply to both existing and future development. Permitted Monday to Friday between 7 am and 10 pm. Work may be permitted on Saturday, Sunday and Statutory holidays, if required. Noise By-Laws will be adhered to over the duration of this project. You may feel vibrations at your home or business due to the use of heavy equipment needed to complete this work. This is quite common and not usually a problem. The construction zone will be fenced-off for the duration of the project with no access to the public. All public areas outside of the construction zone will remain accessible to the public. Expected traffic routes for construction vehicles is along Caldwell Avenue. All information/comments received will be maintained on file for use during the study and may be included in study documentation. With the exception of personal information, all comments will become part of the public record. Please note comments shall be accepted until May 29, 2017. Prior to construction, affected residents will be notified of the commencement of work through the delivery of flyers. The City of Ottawa invites you to attend a Public Information Session to review a construction project planned in your immediate neighbourhood. At the Public Information Session starting at 6:30pm, you will be able to review the design plans for the project and a short presentation will be provided at 7:00pm to explain the nature of the construction project and the anticipated impacts during construction. Representatives from the City, City Councillors Riley Brockington (River Ward) and Rick Chiarelli (College Ward), and the design consultant will be available to discuss the project and to answer your questions. Where: The new pump station will be located on the west side of the reservoir, tight against the berm and adjacent to the existing communication tower compound. Who: Design consulting firm, Parsons, has been retained by the City of Ottawa to develop preliminary and detailed design drawings and specifications for construction of the new pump station. Why: The main objective of the upgrade is to improve the reliability of water supply to roughly one third of the City’s central water distribution system, and to provide additional capacity needed to accommodate future urban growth. The project is identified in the City’s current Infrastructure Master Plan. A new building complete with all new mechanical and electrical equipment to provide for the pumping needs of the various areas in the City. Backup power supply for emergency use during power outages. Four new discharge watermains connected to existing watermains that supply water to the various water Pressure Zones in the City. Accessibility is an important consideration for the City of Ottawa. If you require special accommodation at the public open house, please contact the undersigned. 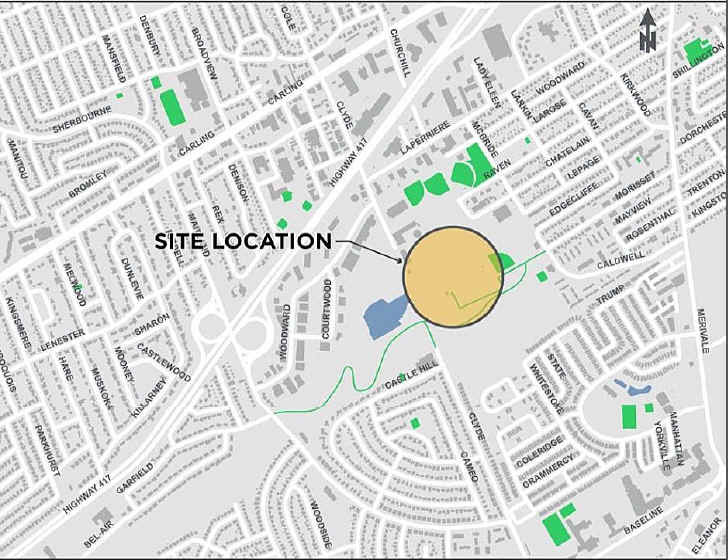 The City of Ottawa has initiated the Carlington Heights Pump Station Site Upgrade Class Environmental Assessment and Functional Design Study. The main objective of the study is to identify a preferred alternative for water supply infrastructure upgrades at the site [ PDF - 949 KB ]. These upgrades are needed to improve the reliability of water supply to roughly one third of the City’s central distribution system, and to provide additional capacity needed to accommodate future urban growth. The project is identified in the City’s current Infrastructure Master Plan. This study will be carried out in accordance with the requirements of Phases 1 and 2 of the Municipal Class Environmental Assessment (Class EA). The study will include identification and evaluation of infrastructure alternatives, selection of a preferred alternative, and a functional design of the upgrades. There is an opportunity at any time during the Class EA process for interested persons to provide comments. With the exception of personal information, comments received become part of the public record. The City of Ottawa has initiated the planning process for the Environmental Assessment (EA) Study for the proposed Carlington Heights Pumping Station (CHPS) Upgrades. The main objective of this study is to prepare the functional design and phasing plan for the proposed CHPS site upgrades in accordance with the Municipal Class Environmental Assessment (MCEA) requirements. This will include identification and evaluation of a range of alternatives that focus on potential pumping station and suction/discharge piping upgrades. The following information has been prepared to provide an overview of the project and an outline of the study process to date. The CHPS was originally constructed in 1963. It draws water directly from the adjacent Carlington Heights Reservoir and supplies a population of over 250,000. The City of Ottawa is divided into various water system pressure zones based on providing customers with an appropriate minimum and maximum water pressure. Figure 2 shows the City's various water pressure zones. The CHPS is currently a two zone station serving the Meadowlands East (ME) and 2W Pressure Zones. The 2W Pressure Zone also supplies all of the water t the 3W and Barrhaven (BARR) Pressure Zones. The station is a back-up source of water for Zones 2W, 3W, and BARR and is the only source of water for the ME Pressure Zone under normal operating conditions. These zones are noted on the following map. The 2008 Infrastructure Master Plan identified the need for additional capacity at the CHPS. The output of this pumping station is limited by pump capacity and the size of the suction and discharge piping near the station. Improvements are needed so that this pumping station can provide adequate emergency supply to Zones 2W, 3W, and BARR. These improvements will also add capacity to accommodate projected urban growth in these zones. This project has been planned as a Schedule 'B' project under the MCEA document (2011). The purpose of the Class EA study is to confirm project need and justification, document existing environmental conditions, examine alternatives and potential impacts, and recommend a preferred alternative for the upgrade. Communication and consultation are an important part of the study process. The City will engage the public through a variety of methods including information posted on the City Web site and meetings, as required, with community associations and approval agencies. The project also benefits from a Technical Advisory Committee that provides guidance and support through the planning and design processes. Allow for predictions of how adverse effects can be mitigated and beneficial effects enhanced. Key social, natural, and geotechnical conditions are represented on the following maps. Each Alternative was assessed against a series of criteria for the purpose of selecting a preliminary preferred alternative. Included in the table below is the rationale for the selection of the criteria and the indicators that will be used to assess the impacts/rate the effect. Alternative solutions were developed based on an understanding of the existing economic, technical, social/cultural, and natural and physical environmental conditions. Technically, these alternatives address existing condition-related issues, hydraulic limitations (pumping, suction and discharge), electrical limitations, and physical space limitations, within the existing pump station. Eight alternatives were developed as follows. Capital costs for the various options ranged from $4.4 M to $7.0 M. The estimates costs include construction costs, hydro allocations and engineering as well as a contingency. Each alternative was evaluated and assessed a comparative score out of 10 for each criteria indicator with 10 representing the least impact/best result. The weighting of each of the criteria groups were considered in evaluating the sensitivity of the evaluation results to variability in criteria weighting. Initially, weighting values for all criteria were scored equally. The weightings were then adjusted to varying degrees to test their influence on the outcome. Examples are illustrated below. Options 2 and 6 are ranked in the top three when Economics, Natural and Technical are weighted high. Option 6 loses its top-three ranking when Social/Cultural is weighted high, reflecting the increasing influence of visual impacts and construction disruption. Options 2 and 6 consistently ranked amongst the highest in the various weighting scenarios. Frees up land to west of reservoir for potential future uses. A major advantage of a suction connection on the reservoir inlet/outlet line (Option 6) is that it effectively increases the volume of available storage in the Carlington Heights Reservoir by approximately 20 ML. This has both operational benefits and economic benefits. Despite the functional and operational advantages of Option 6, the environmental impacts of a major facility on the east side of the reservoir could be substantial, especially considering the fact that technically acceptable locations were available on the west side and would essentially be hidden from view for recreational users of the area (Option 2). Taking into account Option 6 represented the preferred technical solution but Option2, which places the station near the existing site, would be less intrusive, an option combining the advantages of both was developed as the Preliminary Preferred Alternative [ PDF - 371 KB ]. Tell us what you think. Provide your comments by mail or e-mail by June 28, 2013. Chris Rogers, M. A. Sc., P. Eng. The City of Ottawa has completed a Class Environmental Assessment (Class EA) study for the Carlington Heights Pump Station Site Upgrade. This project is needed to improve the reliability of water supply to about one third of the City's distribution system, and to provide additional capacity needed to accommodate future urban growth. This project has been planned as Schedule 'B' projects under the Municipal Class Environmental Assessment document (2007). The purpose of the Class EA study was to confirm project need and justification, document existing environmental conditions, examine alternatives and potential impacts, and recommend a preferred site upgrade alternative. Chris Rogers, M.A.Sc., P. Eng. With the exception of personal information, all comments will become part of the public record. This notice first issued on Thursday, November 28, 2013.